...Suddenly there were the Outsiders. Appearing in massive fleets on the edge of the galaxy they seemed uninterested in conquest, only destruction. Earth's fleets were decimated and the Federation lay on the brink of collapse. In desperation Federation Command chose to strike directly at the Outsider control centres.These immense bases were constructed within hollowed out moons.To destroy them required a direct hit on the base's reactor systems at the very centre of the moon. The only access to the reactor chamber was through 2 cooling ports within the base's equatorial duct. 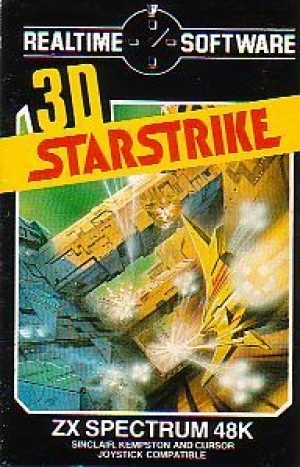 To reach these, however, an attacker was forced to run the gauntlet of the base's heavy ground and space defences. 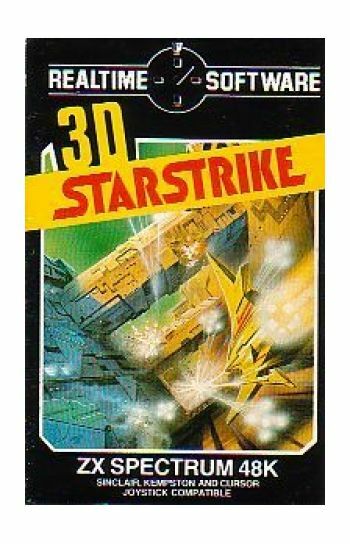 To penetrate these an new generation of starfighters was created-the STARSTRIKE series... Instructions on inlay cards. OPERATES ON SPECTRUM 48k.